You must not use a tyre which has a tread under 1.6 mm Tyres with tread under this limit will slide easily, suffer from extended braking distances and will be more susceptible to rupturing. In wet conditions the vehicle will aquaplane, making braking and handling almost impossible. Tyres with tread under this limit are illegal and may lead to a fine or disqualification. If you drive with low air pressure in your tyre, heat is generated in the tyre. This can result in the rubber and cord separating, which in turn leads to the cord becoming cut and puncturing the tyre. Low pressure can wear the edge of tyre which will shorten the tyre’s life. 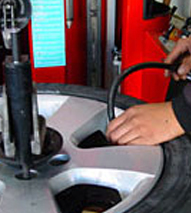 Excessive pressure results in the tyre becoming unpredictable. If the tyre suffers an impact, it is easily ruptured and cut. If you brake hard, the tyre may skid, which reduces tyre life as the centre of the tread becomes worn. Ever wondered what all the letters and numbers mean? click HERE to find out.